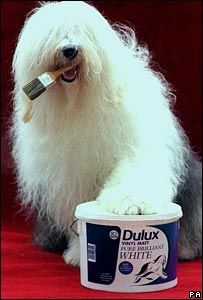 We all know Dulux paint and probably have found memories of the wonderful Dulux dog from our childhood. Dulux has to be the big boy of the the paint market, at least in Europe. It is part of the ICI company and intern Akzo Nobel corporations. One of the largest chemical companies in the world. It is true that in days gone by paint was not the most eco-friendly product in the world, but then we also drank water from led pipes. Massive strides has been made by manufacturers to reduce their carbon footprint and the impact their products have on the environment with Dulux (Akzo Nobel) being one of the companies leading the way. They have recently released their eco-sense range that has dramatically reduced the brands carbon footprint. However, their products are still not completely eco-friendly like some others on the market which we will discuss in more in depth in other posts. So, why do we like using Dulux paint on our painting and decorating projects? Have we been sucked in by the stunning dog and subliminal advertising we have seen since childhood? I’m not sure! All I can state is that through our years of experience decorating many different types of properties, both residential and commercial, we are always really happy with the quality of Dulux paint. It is also readily available to both the public and trade at reasonable prices in any town across the country. From GS Decorating experience you can mix any colour you would like with Dulux’s colour matching service, there isn’t a colour we have not matched yet. All you have to do is take along a sample, colour from a magazine or what ever you like to a local stockist such as B&Q and they will be able to match it for you in store. They do try to sell you some rubbish add-ons with clever marketing tactics that do nothing apart from cost you money. But being a major corporation we will forgive them as they have to pay all their employees and their part in the economy somehow. Things like the paint pad give a wide birth, you’re only wasting your money. Quality paint is, well quality paint, and Dulux is the leading brand within the high-street market place. For your general home renovation projects you can’t really go far wrong. I wouldn’t like to say it’s a better quality to other brands like Farrow & Ball, but it is also no less. There are many paint brands in this category but for its availability, colour matching service and price you can’t go wrong with Dulux. If you would like GS Decorating to decorate your home or building and have no current preference of paint brand we would recommend you use Dulux. However if you have any special such as a complete eco-paint or you have already chosen a different brand we will happily work any of your choice. In another post I will explain more about all the different various types of paints available and in what circumstance they can be applied. On their web site you can also get: interior design tips, colour matching tips, their is also a very good paint calculator to help you work out paint you will need to buy for your project. GS Decoration is a quality painting and decorating firm based in Essex. We undertake all forms of both domestic and commercial painting and decorating work. Please call us now if you need help in any decoration project.